Paul the Psychic Octopus, mystic ocean trail-blazer and impartial soccer fan, died last night. As both a Cephalopod, and a Seer, he touched the hearts, and opened the minds of millions. Not only did he make the world see that divining the future might be possible, he did so as an Octopus. Psychics and Sea Life aren’t given much respect in our world these days. Paul swam up for both and we thank him for that. I salute you Paul. You will be missed. 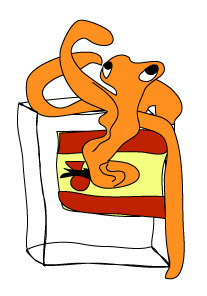 § 5 Responses to We'll Miss You Paul the Octopus"
Ah, he was a psychic cephalopod sensation. He will be missed. I regret not sending him a deck before his demise. I am so depressed over Paul. You are currently reading We'll Miss You Paul the Octopus at The Tarot Room.